In the next two SlOkams (this and the next one), ALavandhAr is enjoying emperumAn‘s togetherness with pirAtti (SrI mahAlakshmi). In this first SlOkam, ALavandhAr mercifully explains her greatness and ISvara‘s great love towards her. thava bhujAntharam yasyA bhavanam chakartha – You mercifully made your divine chest which is said in SrIvishNu purANam 1.9.122 “sarvayagyamayam vapu:” (the divine form which is fully made of yagya (fire sacrifice)), as the divine private quarters of pirAtti. The word “yasyA:” is used, due to the well-established nature of this through sacred texts. SrIvishNu purANam 1.9.122 “… sarvayagyamayam vapu: adhyAsthE …” (Oh dhEvi! In the divine body of emperumAn which is made of yagya, who is holding the mace, is the God of Gods, who is meditated upon by yOgis, who else is residing other than you?). SrIvishNu purANam 1.91.5 “paSyathAm sarvadhEvAnAm yayau vakshasthalam harE:” (When all the dhEvathAs were looking, SrIdhEvi reached the divine chest of hari [during the churning of ocean]), thiruppallANdu 2 “nin valamArbinil vAzhginRa mangai” (the divine lady who resides in the right side of your chest), thiruvAimozhi 10.6.9 “thigazhginRa thirumArbil thirumangai thannOdum thigazhginRa thirumAlAr” (the shining SrIman nArAyaNan along with the divine lady in his shining divine chest), thiruvAimozhi 7.2.9 “en thirumagaL sEr mArban” (My lord who has SrI mahAlakshmi in his chest), thiruvAimozhi 4.4.2 “maiyakaNNAL malar mEl uRaivAL uRai mArban” (emperumAn who chest is the residence of the dark-eyed SrI mahAlakshmi who had the lotus flower as her residence before), thiruvAimozhi 6.10.10 “alarmEl mangai uRai mArbA” (Oh one who has the chest which is the residence of SrI mahAlakshmi who resides on a lotus flower), thiruvAimozhi 10.10.2 “mArvaththu mAlai” (pirAtti who is like a garland on your chest), thiruvAimozhi 9.4.1 “seyyAL thirumArbinil sEr thirumAl” (the reddish one who is united with the divine chest of SrIman nArAyaNan). thava priyam dhAma yadhIyajanmabhU: – The divine birth place of such pirAtti, which became the dear abode of your highness who is as said in thiruvAimozhi 1.1.1 “ayarvaRum amarargaL adhipathi” (the master of the nithyasUris who are free from any delusion, ignorance etc). SrIvishNu purANam 1.9.141 “… SrI:pUrvamudhadhE puna: … dhEva dhAnava yathnEna prasUdhA’mruthamanthanE” (First SrIdhEvi was born as the daughter of kyAthi and bhrugu maharishi; again, during the churning of the ocean, she appeared by the efforts of dhEvas and asuras). SrI rAmAyaNam ayOdhyA kANdam 30.42 “nEdhAnIm thvadhruthE sIthE svargO’pi mama rOchathE” (Oh sIthA! in your absence, even svarga (heaven) will not give pleasure to me). jagath samastham yadhapAnga samSrayam – As said in thaiththirIya samhithA 4.4.12 “asyESAnA jagathO vishNupathnI” (goddess of all, divine consort of vishNu), SrI sUktham 9 “ISvarIm sarvabhUthAnAm” (the goddess of all creatures) and SrIvishNu purANam 1.9.126 “thvam mAthA sarvalOkAnAm” (you are the mother of all worlds), both nithya vibhUthi (spiritual realm) and leelA vibhUthi (material realm) are existing by her gentle glance. yadhartham ambhOdhiramanthi – He mercifully churned the ocean to attain her as said in periya thirumozhi 6.1.2 “viNNavar amudhuNa amudhil varum peNNamudhuNda emperumAn” (While the dhEvathAs were consuming the nectar, emperumAn accepted the essence of that nectar, which is SrI mahAlakshmi). abandhi cha – He built the bridge across the ocean, unable to bear the separation of her. SrI rAmAyaNam yudhdha kANdam 126.12 “Esha sEthur mayA badhdhas sAgarE salilArNavE | thava hEthOr viSAlAkshi! naLasEthus sudhushkara: ||” (Oh wide eyed sIthA! 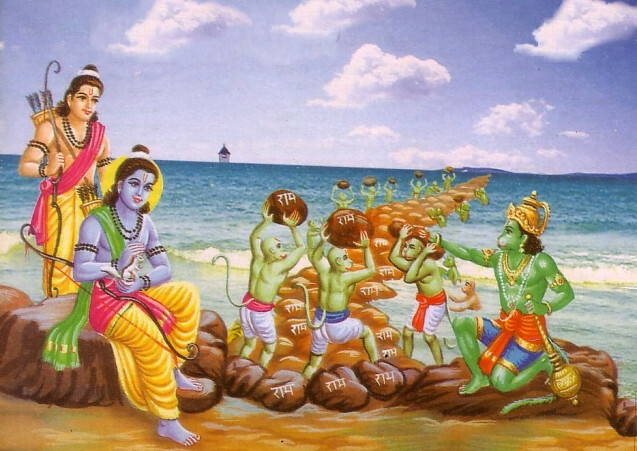 In this ocean filled with water, this bridge named naLasEthu which is difficult to build, was built by me for you). This entry was posted in Other, sthOthra rathnam on January 19, 2017 by Sarathy Thothathri.